MEXICO CITY—A second round of NAFTA renegotiations began Friday with officials expressing optimism despite U.S. President Donald Trump’s suggestions he could withdraw the United States from the 23-year-old trade pact. Mexico has also said it won’t stay at the table if it doesn’t get a fair shake or if Washington triggers an exit clause, and the uncertainty has raised concerns among businesspeople in all three countries that billions of dollars in trade and investment could be threatened. Delegations from the United States, Mexico and Canada gathered at a Mexico City hotel for discussions on the North American Free Trade Agreement that Mexico’s Economy Department said would focus on issues such as rules-of-origin, electronic commerce, the environment and anti-corruption measures. “There are conditions to negotiate, despite some statements,” said Gerardo Gutierrez Candiani, head of Mexico’s special economic zones agency. 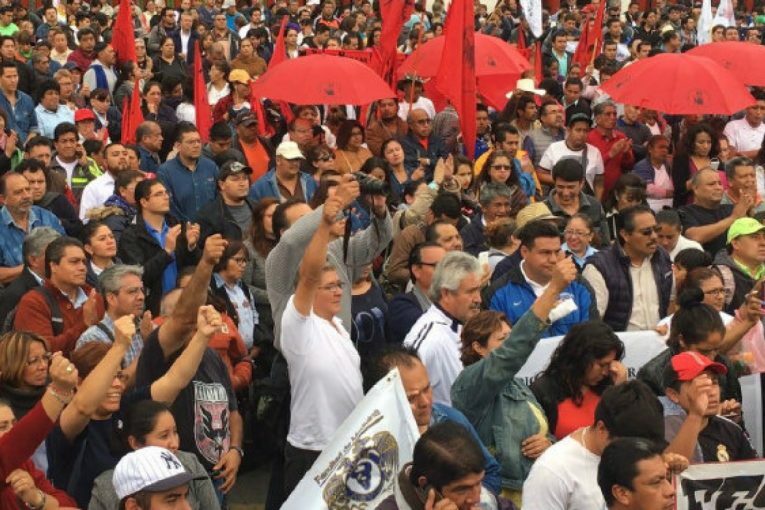 A number of union leaders staged a rally in Mexico City as officials arrived for the fresh round of negotiations. Canadian auto workers leader Jerry Dias of Unifor, one of Canada’s largest unions, was among them. The crowd of hundreds chanted and cheered as Dias voiced his demands, speaking through a Spanish-language interpreter. The demands include a transformation of Mexico’s unionization practices; higher wages in Mexico; an end to right-to-work laws in the U.S.; and an international mechanism to make sure countries respect labour promises. Dias said everyone talks about ensuring the new NAFTA helps working people — now it’s time for governments to prove they mean it. The NAFTA era has not produced higher salaries for Mexicans, he said, and is instead dragging down the labour market across the continent. He asked why, if workers in Canada and the United States make $35 an hour, a Mexican worker couldn’t make the equivalent 525 pesos an hour. People in the crowd laughed at the idea of what would be, in Mexico, an exponential pay raise. Other speakers at the event shared stories about intimidation of labour and even the murder of some workers. But some analysts say the picture painted by Dias is overly simplistic. Although Mexican salaries haven’t grown, statistics show the workers faring best are in trade-dependent sectors. The auto industry also rejects the idea that higher salaries in Mexico would lead to more or higher-paying jobs in Canada and the U.S.
Flavio Volpe of the auto-parts manufacturers’ association said production has shifted to Mexico for a variety of reasons, labour costs being just one. And if low-skilled tasks like stitching seatbelts suddenly became exorbitantly expensive in Mexico, Volpe said, the jobs would move east to Asia, not north. Among other things, Washington wants local-content rules tightened to avoid imports largely made in third countries from being considered “made in North America” just because they were assembled in Mexico. Gutierrez Candiani said other issues on the table include labour standards and dispute resolution mechanisms. The United States also opposes the current system of private arbitration panels. The current agreement allows binational panels of private experts to decide differences, making it harder for one nation to unilaterally impose tariffs on another. The United States wants to eliminate those panels, but Canada and Mexico fear that would allow it to throw its greater weight around and impose tariffs on imports that allegedly harm local producers or are being “dumped,” or sold below their real price. Talk of more such tariffs drew concern from a newly formed alliance of U.S. and Canadian fruit and vegetable companies. U.S. companies now frequently grow produce in Mexico in the winter or contract it from Mexican companies. Mexico’s Economy Department said the five days of talks will be conducted in 25 working groups with an expected wrap-up date of Tuesday. The first round of talks took place in Washington in mid-August, and several more rounds are expected.